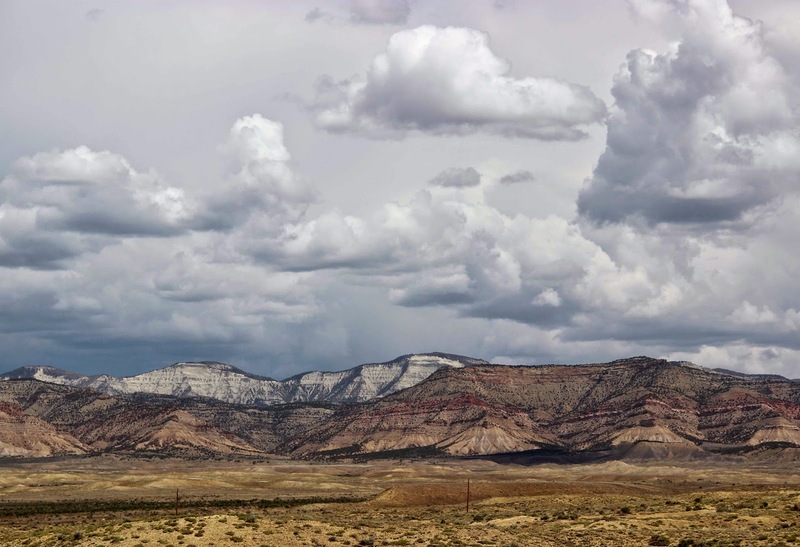 The Colorado Plateau is spectacularly scenic. Every year many hundreds of thousands of people admire its mesas, monuments, narrow winding canyons and rocks colored red, orange and white. But they speed right past the high desert shrublands that cover much of the Plateau. 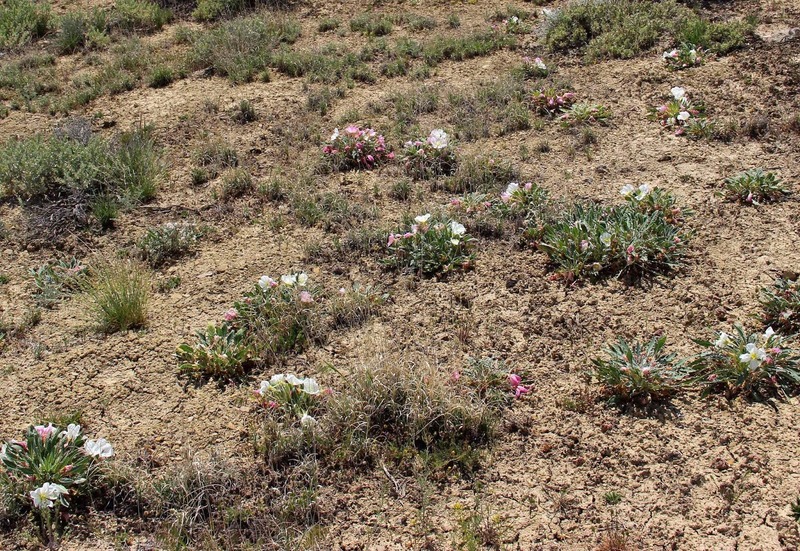 This is drab boring vegetation – monotonous in topography and color. But in spring – if you were to stop and look – you would find the dull green shrublands brightly decorated in white and pink. 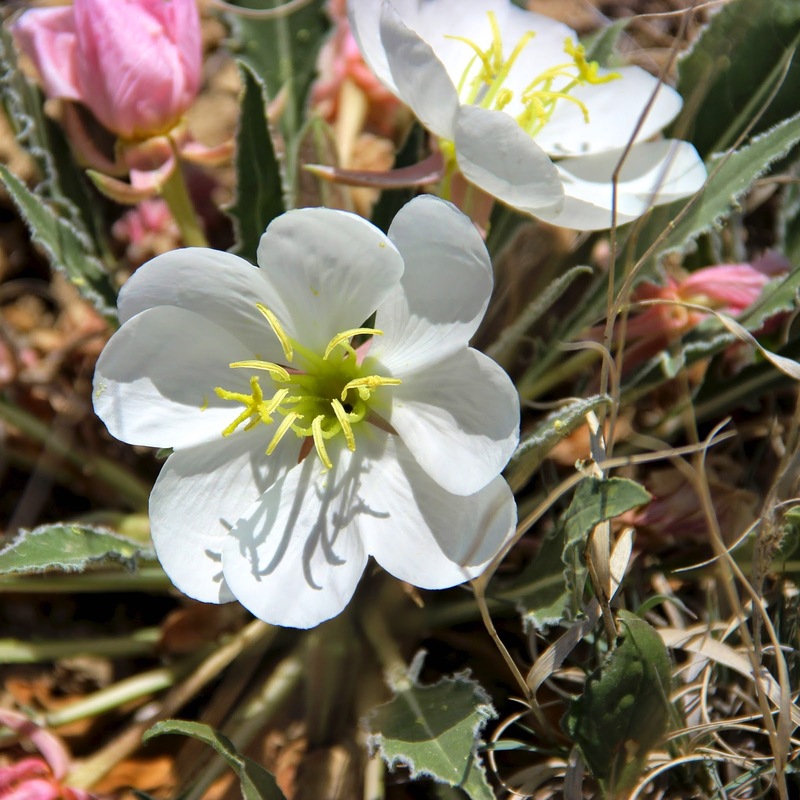 Evening primroses are in bloom! Old-timers call them gumbo lilies because they thrive in soil that turns to really sticky mud (gumbo) when it rains. 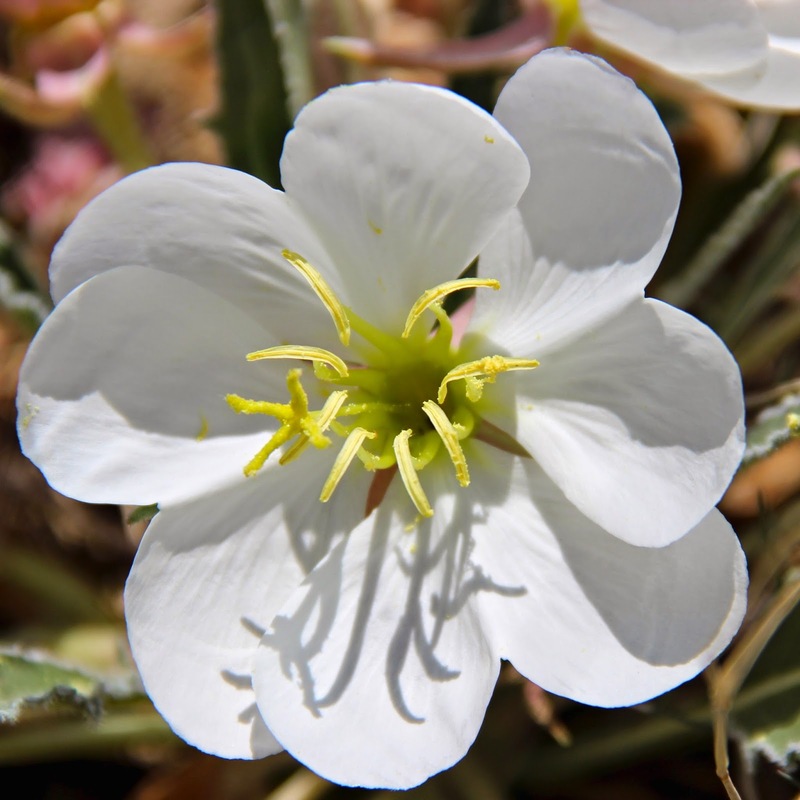 Tufted evening primrose, Oenothera caespitosa; flowers grow from tufts of basal leaves. Soon this flower will be as pink and wilted as its comrades. 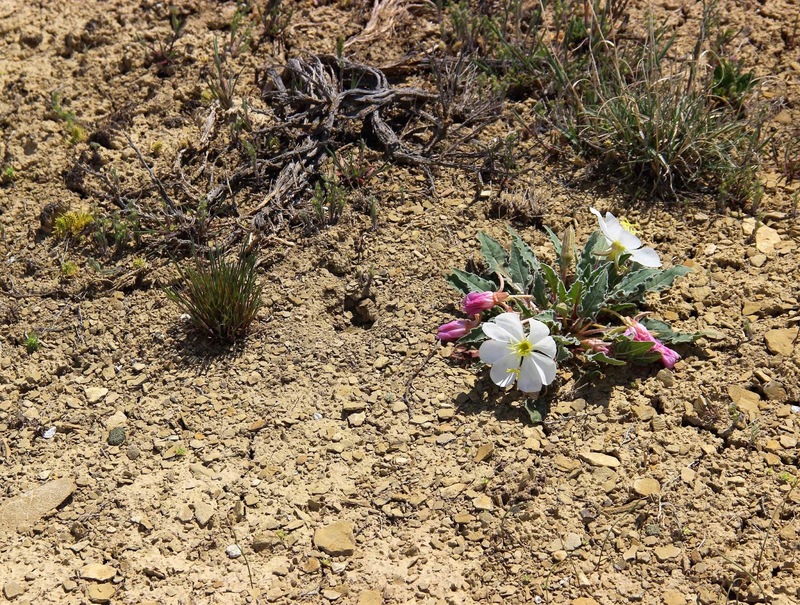 Evening primrose flowers open in the evening, and last into the next morning. 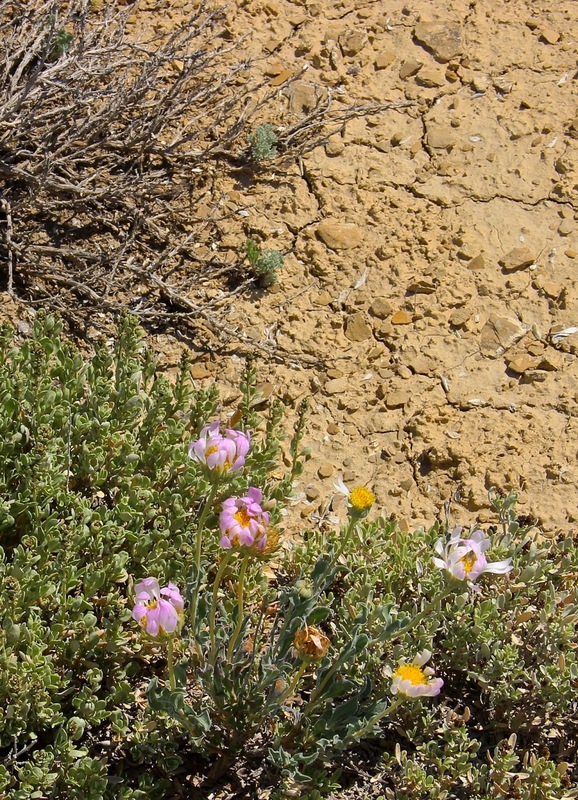 They use white and pink to advertise – to recruit pollinators. White – "Come on in, I have pollen aplenty!" I smiled when I saw flower parts (and their shadows) clearly arranged in multiples of four. 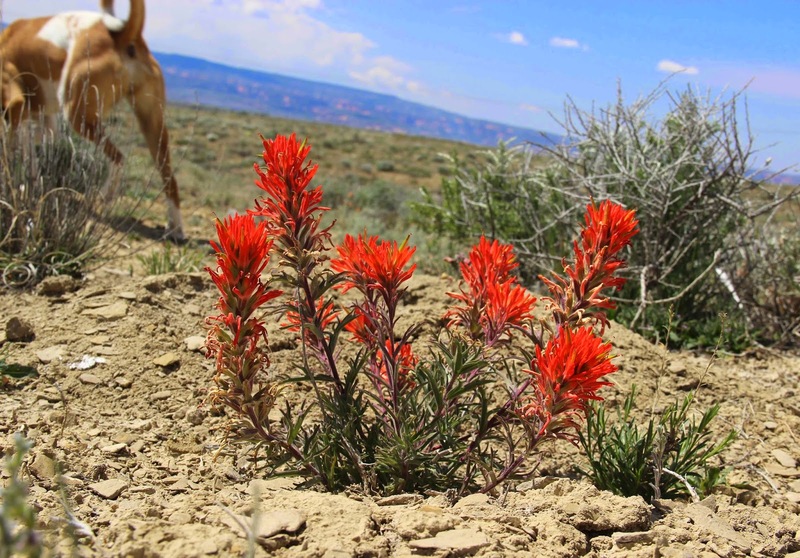 Deep fond memories resurfaced – of field botany class and diagnostic characteristics of plant families. 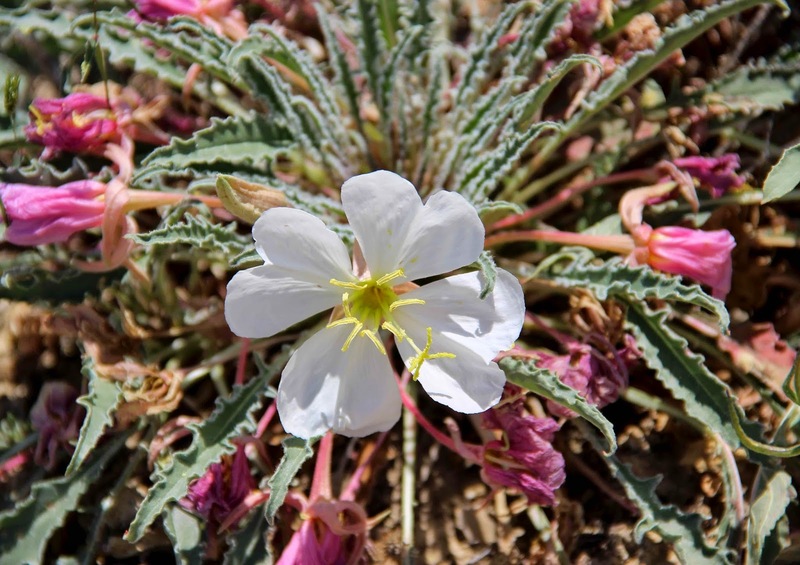 4 petals, 8 stamens, 4-lobed stigma (left center) … must be Onagraceae, the evening primrose family. 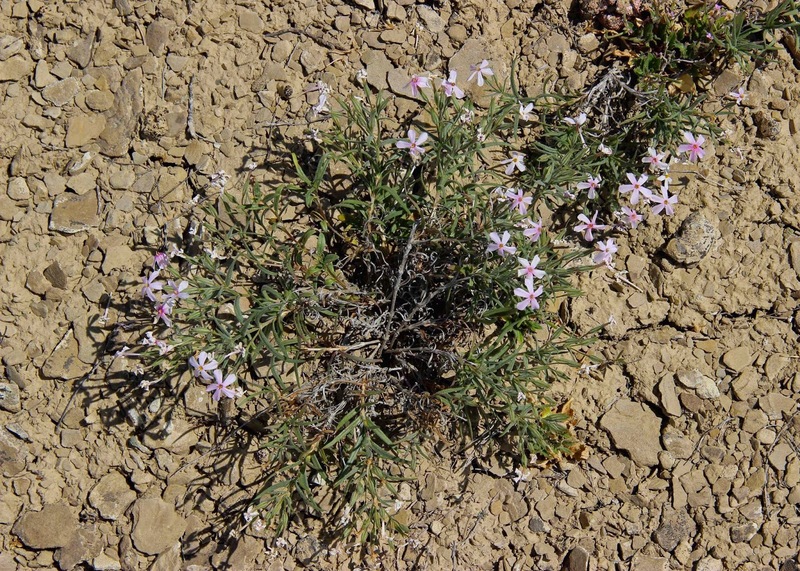 A desert phlox, Phlox sp. A very elegant sego lily, Calochortus sp. Woody aster was especially common. 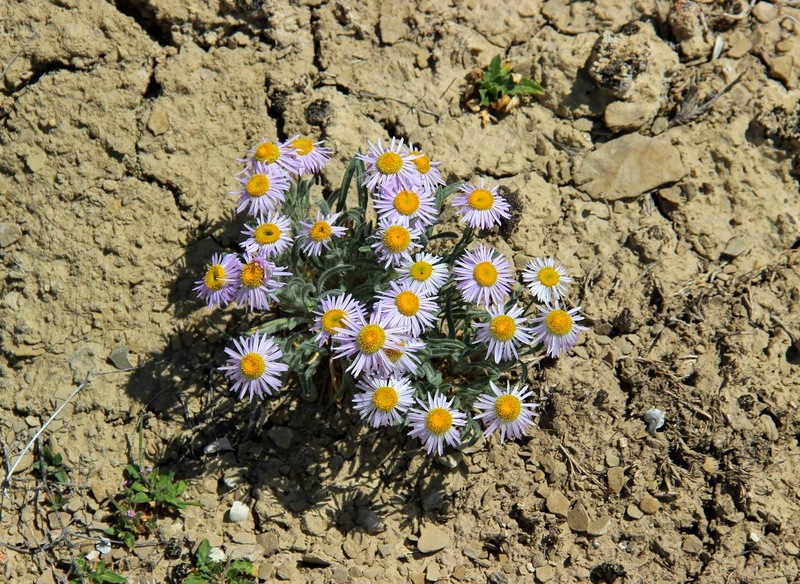 Its older flower heads had pink wilted rays … does the woody aster advertise with white and pink too? Old woody aster heads have turned pink. Many other flowers were in bloom, but the wind picked up so photography came to an end. High desert shrubland below the Book Cliffs; north of Fruita, Colorado. The commentary at the top is from Through the eyes of children, a field guide to the Colorado Plateau by Tope Elementary School students & D Gallegos, 1998. For sale here. 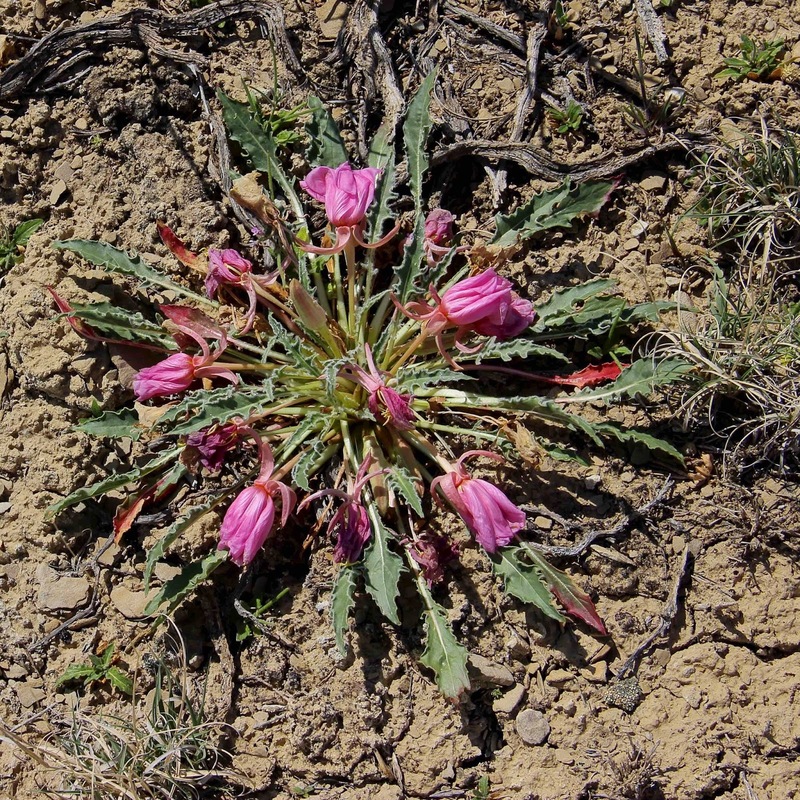 Two months have passed since my report on the few street plants tough enough to survive in Laramie in February. 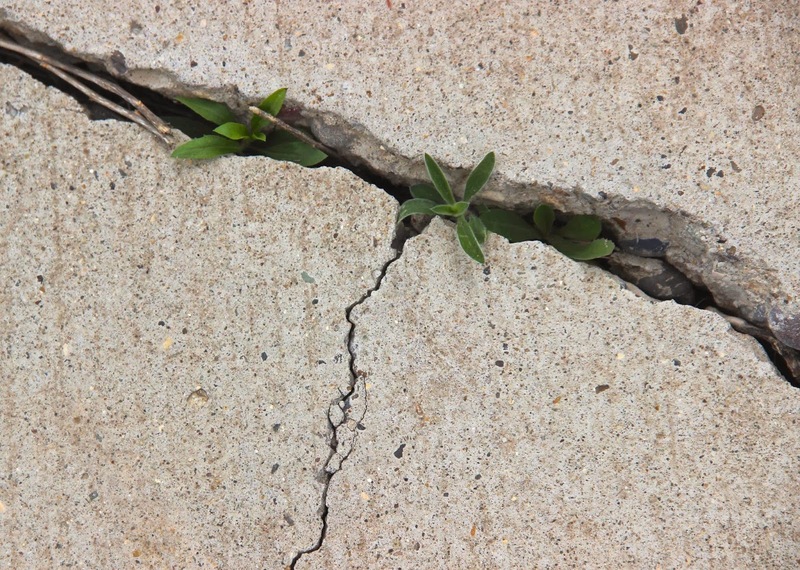 But now it’s spring, and I’m sure that a strong urge to grow is swelling in many seeds hiding in cracks and crannies in concrete and asphalt. Probably fresh young shoots are already out, determined to enjoy their moment in the sun. This post is special – it's a collaboration. My host wrote a poem for the occasion! when the day listens to the Sun. a competitive edge; new modes of perseverance. is a helpless choice; first comes water, then comes ice. Danny Rosen is a poet in Fruita, Colorado. His poems have appeared recently in San Pedro River Review, Comstock, Fruitapulp, Pilgrimage, Santa Fe Literary Review, and Malpais Review. 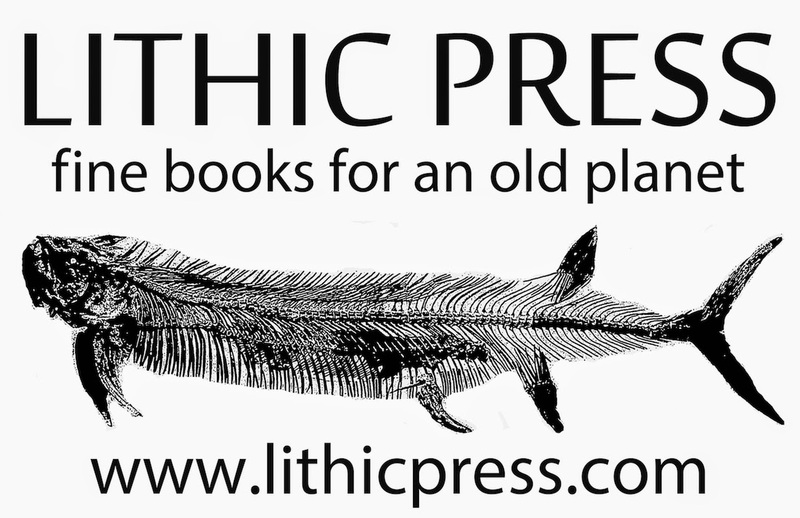 After working in geology, astronomy and education, Danny decided that making books would be a most useful endeavor. 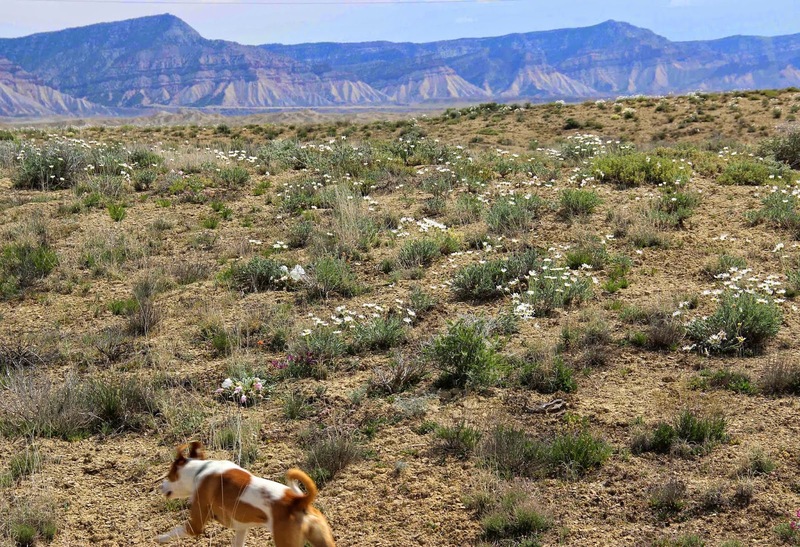 He lives among dogs in the desert of western Colorado, where he runs the Lithic Press. Tree is about six feet tall; crown is twelve feet across and loaded with cones. The small pine I dreamt about last night must have been a pinyon. 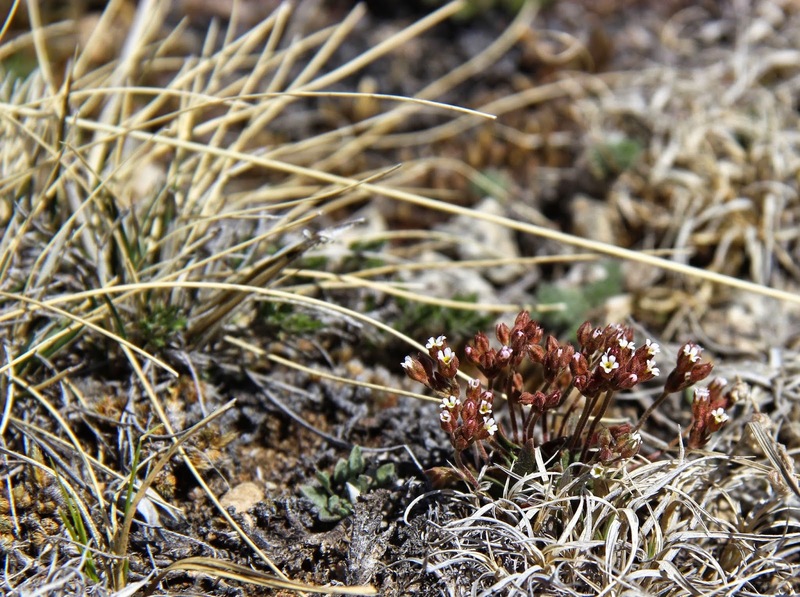 The site looked right: dry, rocky, sparsely-forested – really more of a woodland – and little ground cover. Yes, it must have been a pinyon pine. Do I repeat myself? 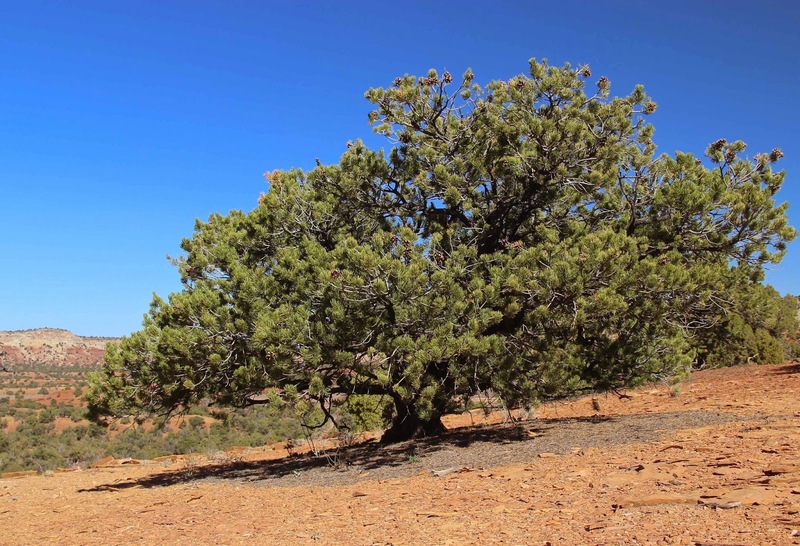 No, pinyon pine is not a tautology – not one of those pointless combinations of English and Spanish like Table Mesa (tr: Table Table) or Cuesta Grade (tr: Grade Grade). 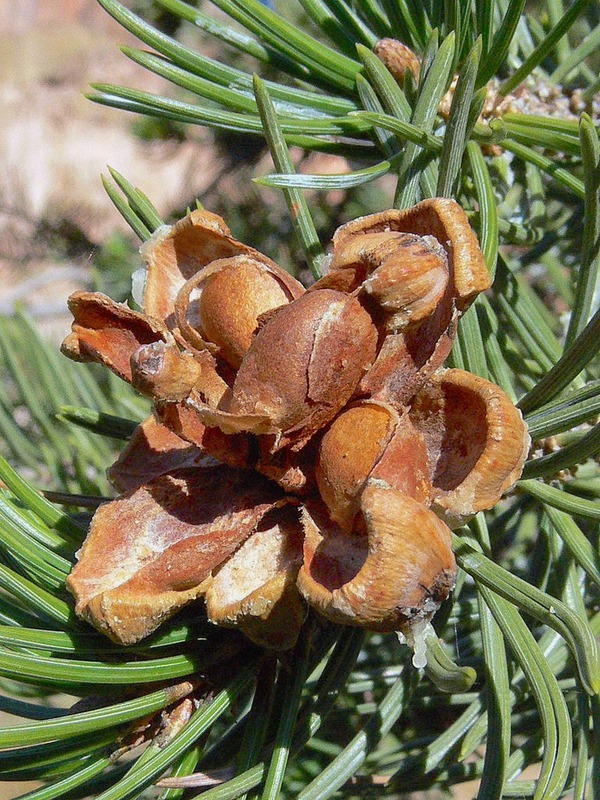 A pinyon (piñón in Spanish) is the seed (often called a nut) of the pinyon pine (pino piñonero in Spanish). We call the trees pinyons for short. Small trees, small cones, BIG seeds! Source. The seeds of pinyon pines are large and nutritious – so much so that jays, humans and other animals put a lot of time and energy into collecting them. Pinyon jays are especially dependent on pinyons. In late summer, they go to work picking sticky sappy green cones and hammering them apart to extract fat seeds. These they carry to traditional nesting areas, where they stash them on the ground among dead needles and twigs. The jays continue collecting into fall; their work gets easier as the cones dry and open up. By the time the harvest is over, many thousands of pinyons have been cached. When spring comes, they're eaten by nesting female jays and the young fledglings. 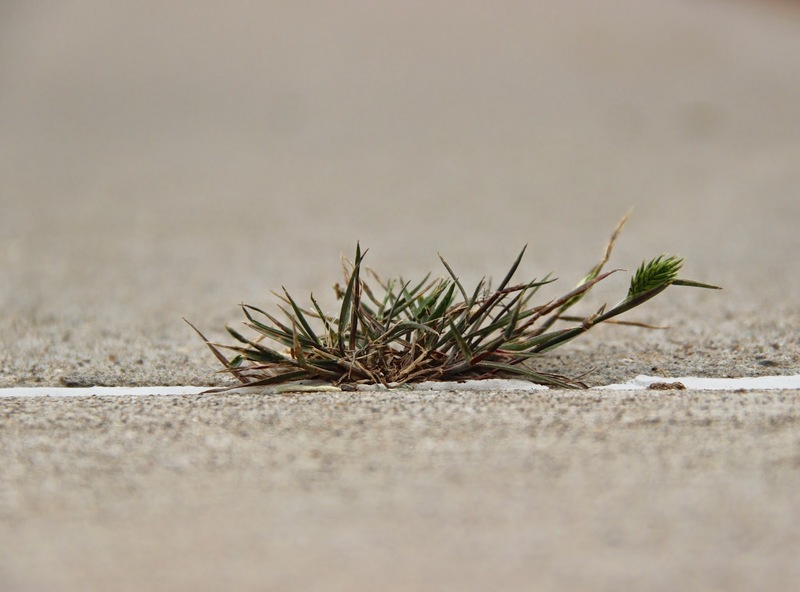 But some seeds are always overlooked, and some germinate and grow. Thus the jays return the favor … by planting pinyon pines. 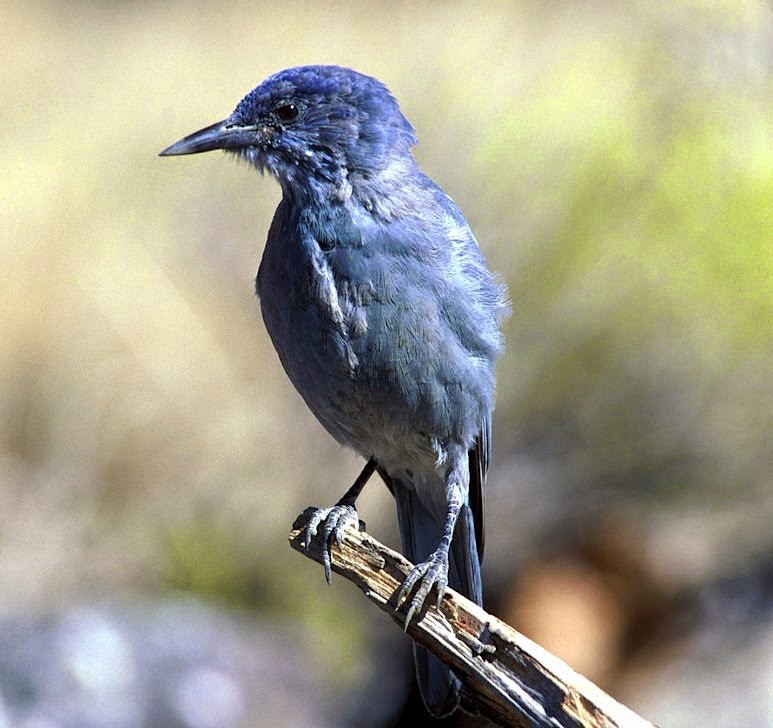 Pinyon jay. In the old days, Westerners called it the blue crow. Source. There was a time when people also survived on pinyons. In the old days, tribes harvested and stored seeds each fall. Tasty, nutritious, calorie-rich pine nuts made excellent winter food, especially where agriculture wasn’t possible. But in some years, pinyon yields were poor; for tribes without agriculture, such years were very tough. Pinyon pines are rare here in Wyoming. This is the north edge of their range; they grow only in the extreme southwest part of the state. When I visited Flaming Gorge Reservoir last fall, I found a few close to the state line (with Utah). They were mostly saplings and young trees. 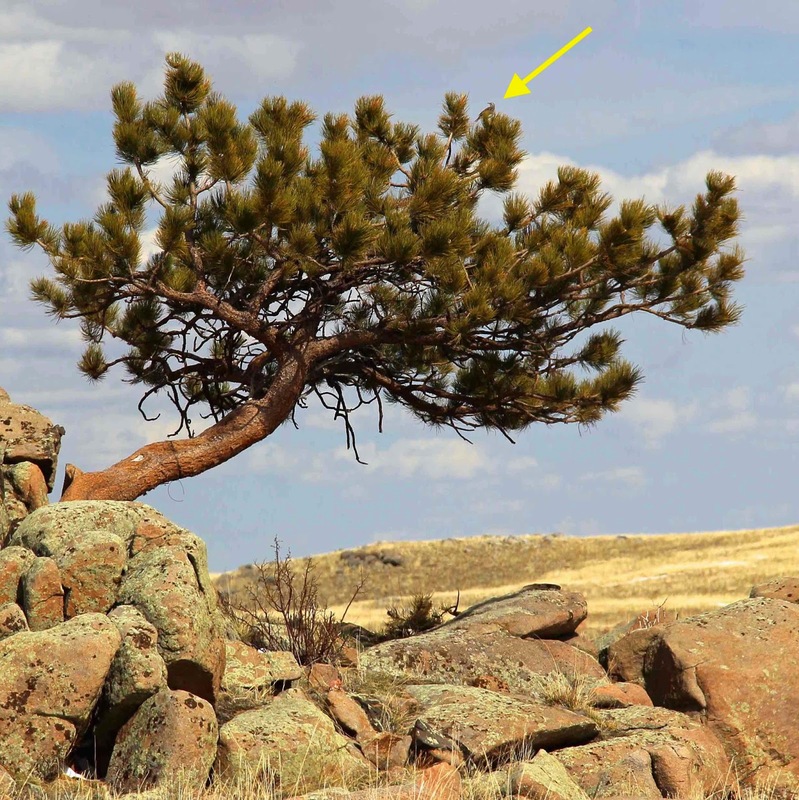 Does this mean the pinyon is extending its range? 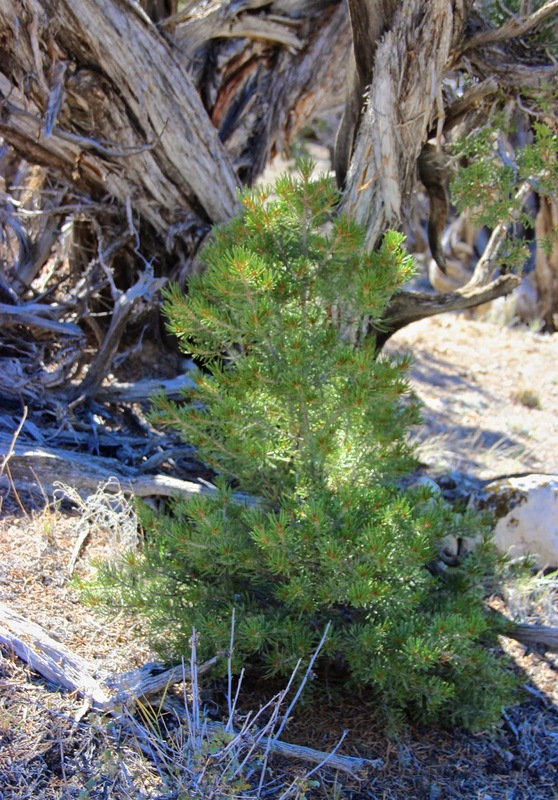 Pinyon sapling in shady habitat. 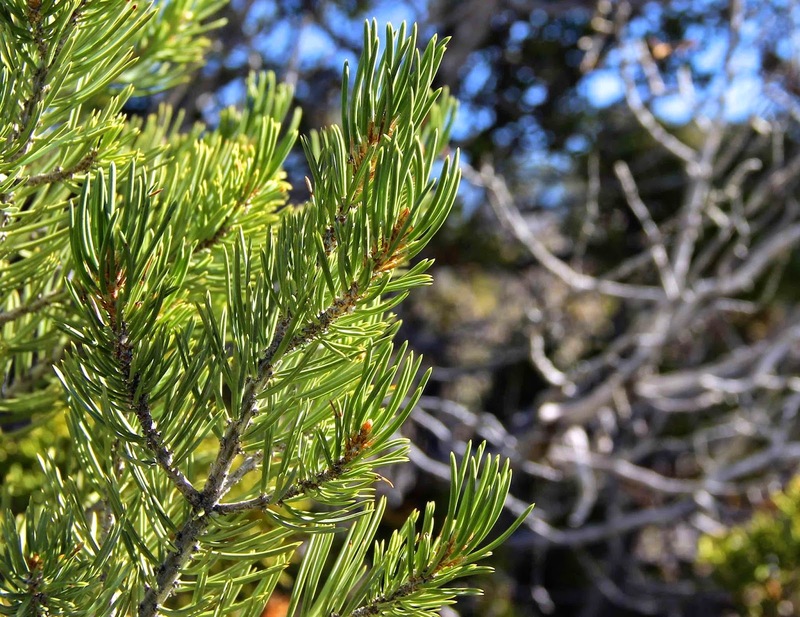 The two-needle pinyon, Pinus edulis, is the one that grows in Wyoming. Soon I will be where pinyon pines are common – where they partner with junipers to form pinyon-juniper woodlands that occupy more than 75,000 square miles in the western US. 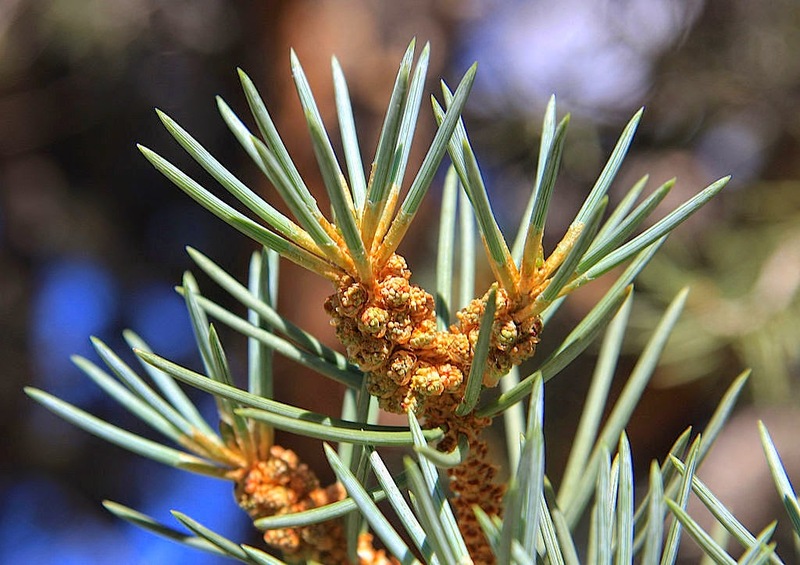 On the Colorado Plateau, the pinyon is the two-needle, Pinus edulis, the source of "American" pine nuts. As the name suggests, they have two needles per fascicle (bundle) ... usually. Some individuals also have three-needled fascicles. Two-needle pinyon pine, also called Colorado pinyon pine. 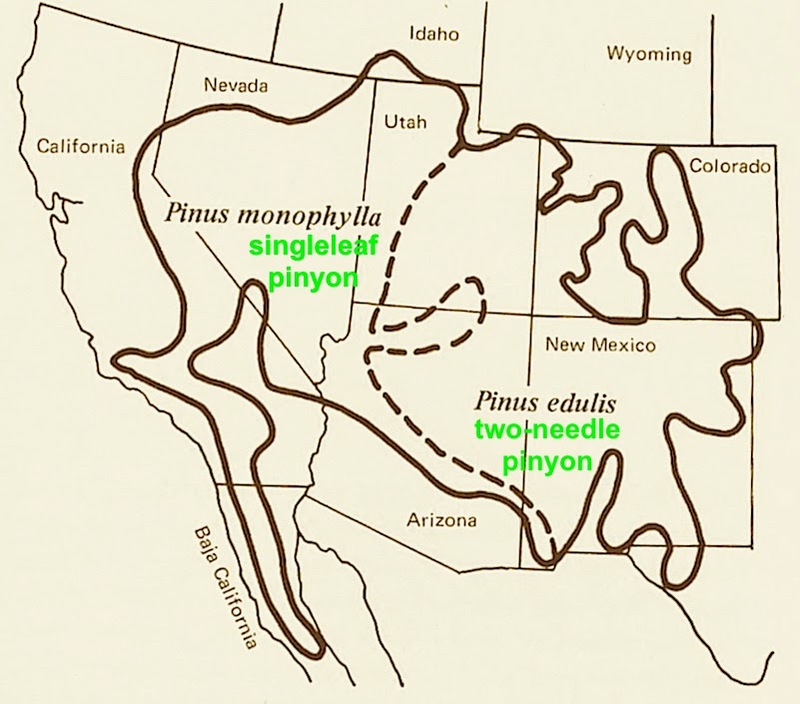 When I leave the Colorado Plateau and enter the Great Basin to the west, the pinyons will change. 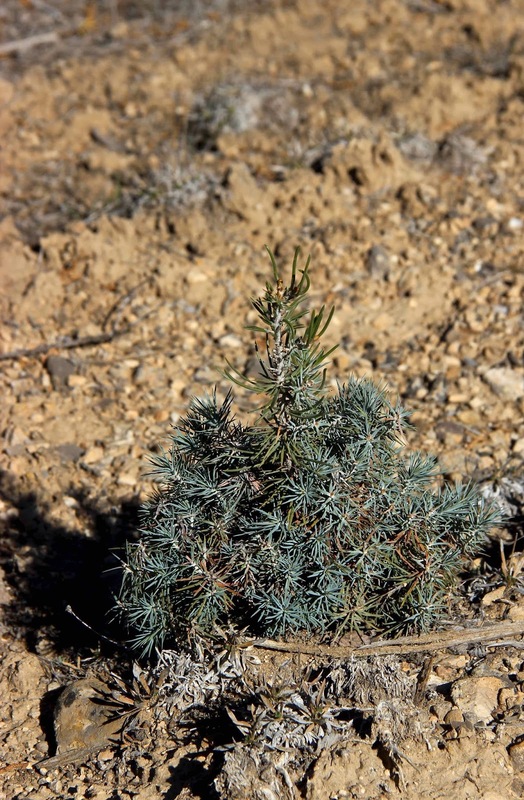 Single-leaf pinyon, Pinus monophylla, will replace the two-needle. As you might guess, it has a single needle per fascicle. Single-leaf pinyon. Needles are single but still “bundled” – note fascicle along base of each. Source. 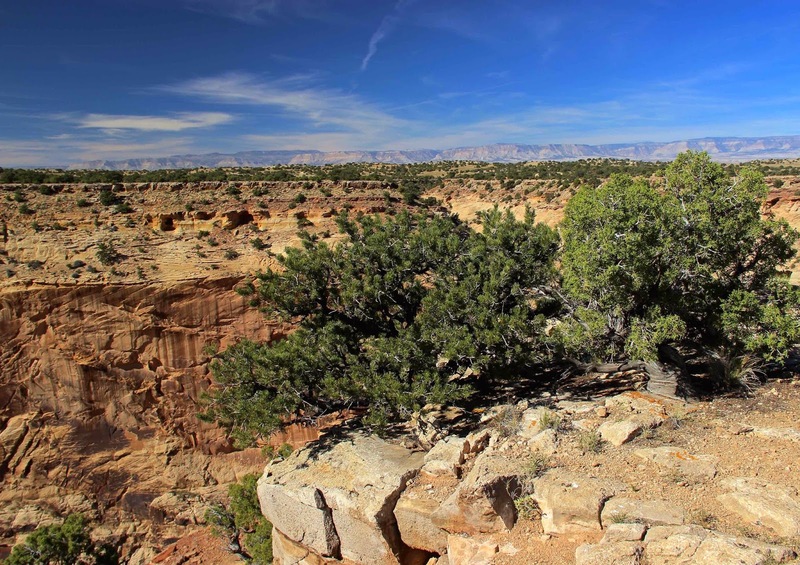 I expect to see the single-leaf pinyon off-and-on for much of the trip, as it also grows in the Mojave Desert, Tehachapi Mountains and as far west as the southern Coast Ranges of California. This was the first pinyon pine I met ... long ago. 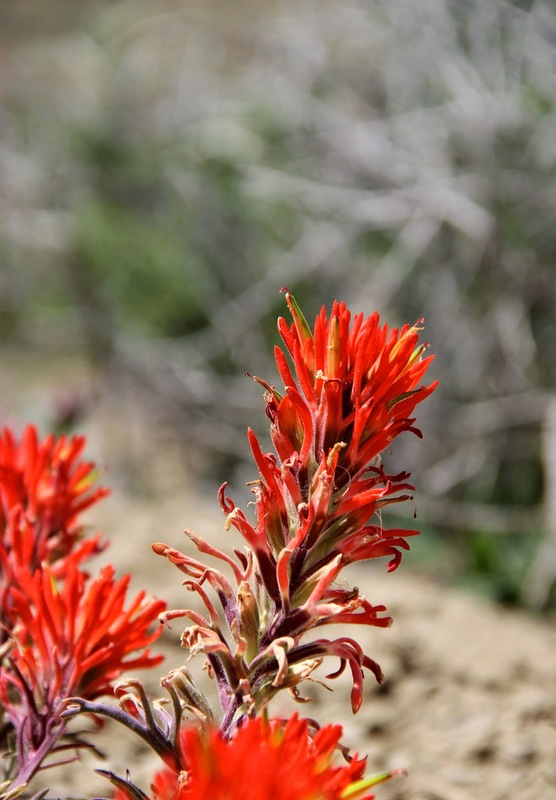 I made its acquaintance in the Coast Ranges when I was a field botany student. I look forward to renewing our friendship. Where the pinyon pines grow. After Lanner 1981. I'm eager to find, photograph and learn more about pinyon pines. Already they impress me, in part because they defy our concept of great trees. We generally admire trees for being tall, strong and ancient. We have organizations devoted to finding and registering the largest individual of the various kinds of trees – the champions. But is anyone looking for a champion pinyon pine? Probably not. 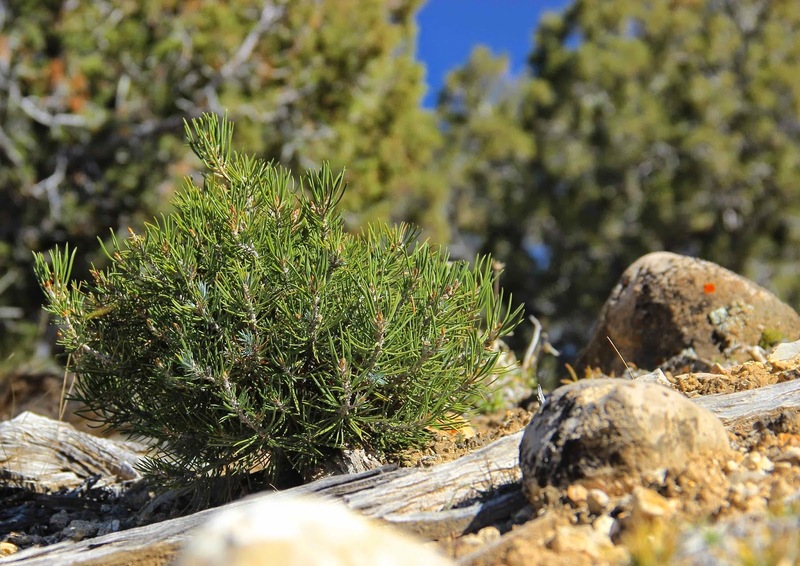 Two-needle pinyon with its woodland partner, the Utah juniper. All three of us are 5 ft 6 in tall. In the old days the Washo people lived by a river created by Wolf-god. Every fall they gathered to collect pine nuts – and hunt, feast and sing. But then there was a terrible drought and the river dried up. Fires destroyed the pines, so there was no food. Many people died; the rest were severely weakened. Wolf-god came back to help. He scattered pine nuts, and trees soon grew. But the people were too weak to climb. Wolf-god tore off the tops of the trees, and put them directly in the ground. The Washo could harvest nuts from the low crowns, so they survived. Pinyons would be unaffordable if Wolf-god hadn’t made the cones easy to reach. Source. Lanner, RM. 1981. 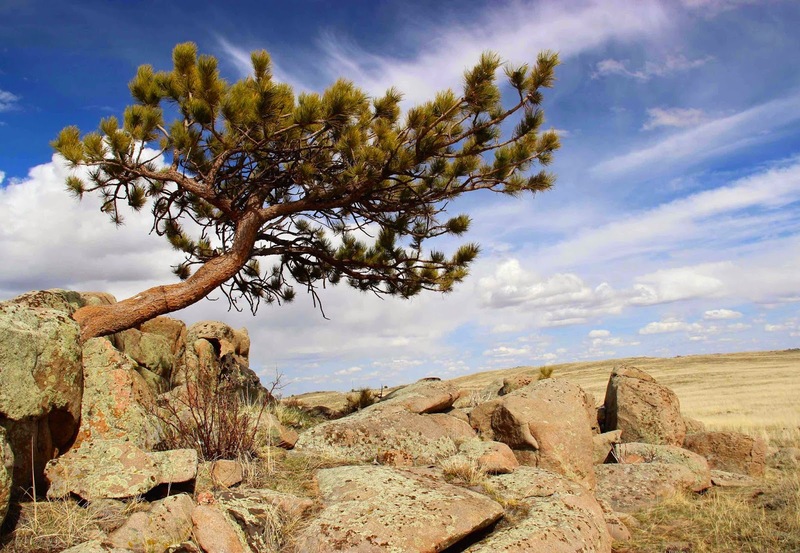 The piñon pine, a natural and cultural history. University of Nevada Press, Reno. In Wyoming, we’re blessed with public lands. 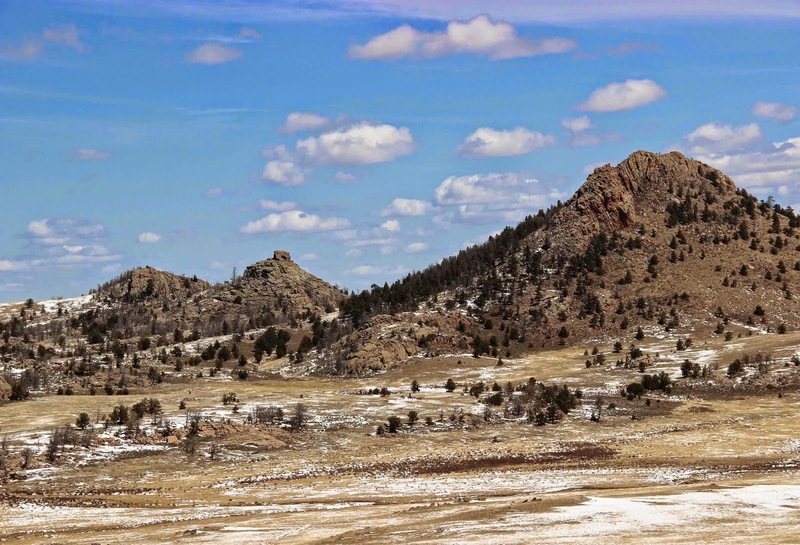 The Federal government holds in trust for us 3.5 million acres – 55,000 square miles – 48% of the state. This is a treasure that too many people take for granted. They should live where land is mostly private – other states, other countries. Then maybe they would appreciate our public lands and the importance of keeping them public. 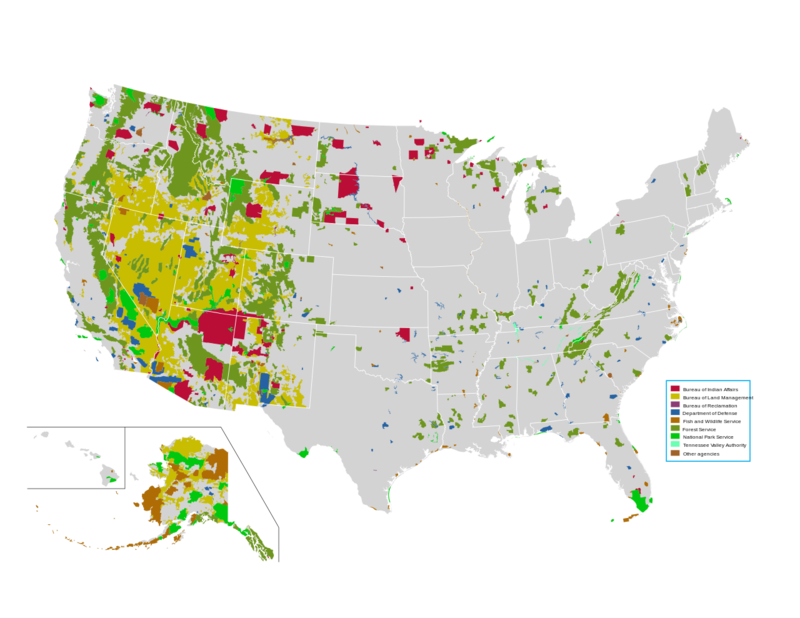 US Federal lands (including Indian Reservations, which are not public). Federal public lands in Wyoming. 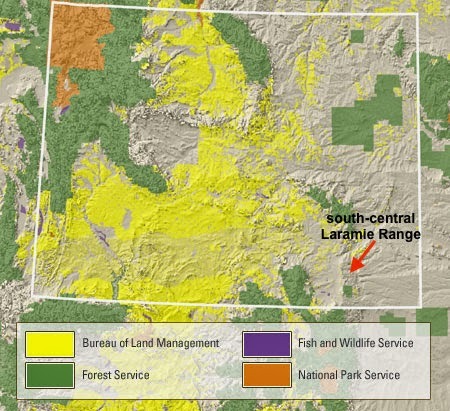 Note that there are none in the south-central Laramie Range. Federal lands are not uniformly distributed. In the eastern part of the state (where I live) much of the land is private. Fortunately there are exceptions. Look closely at an ownership map and you will see scattered blue squares. 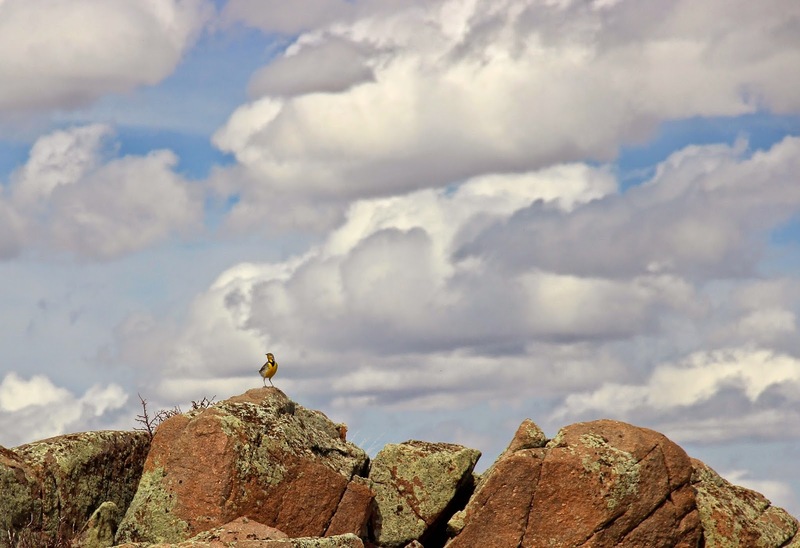 These are State Trust Lands – one-square-mile opportunities for the public to discover and enjoy natural history in areas otherwise off-limits. 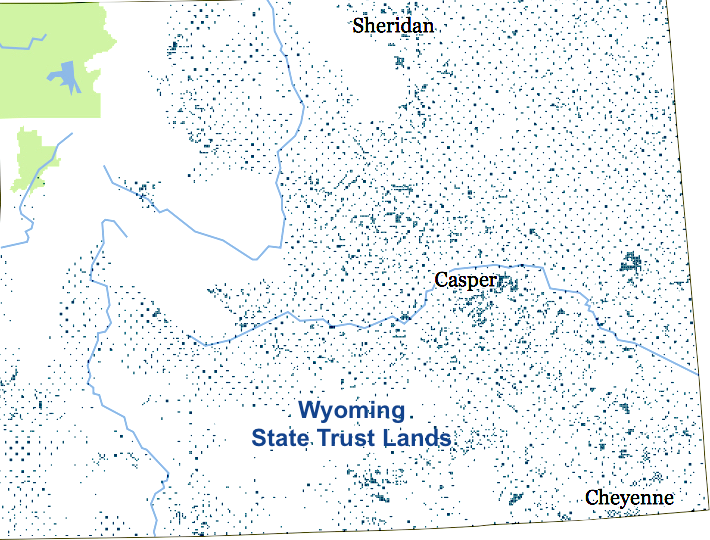 State Trust Lands in Wyoming are public, but there are some restrictions. Most importantly, they’re only accessible if there’s a public way to get there. 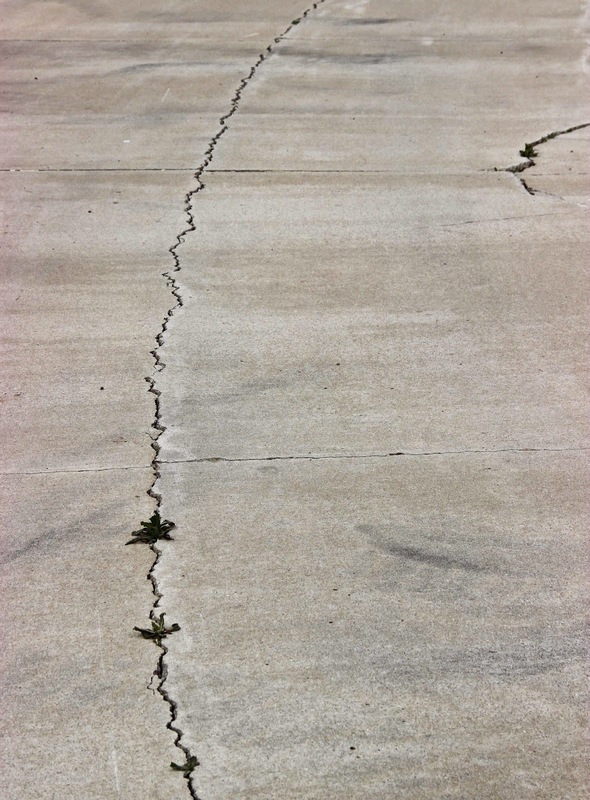 Do NOT cross private land without permission in order to reach a state section – that’s trespassing! Right of access can be confusing, and conflicts are common. The Office of State Land has released a handy app that clarifies which lands are open and any restrictions that apply. 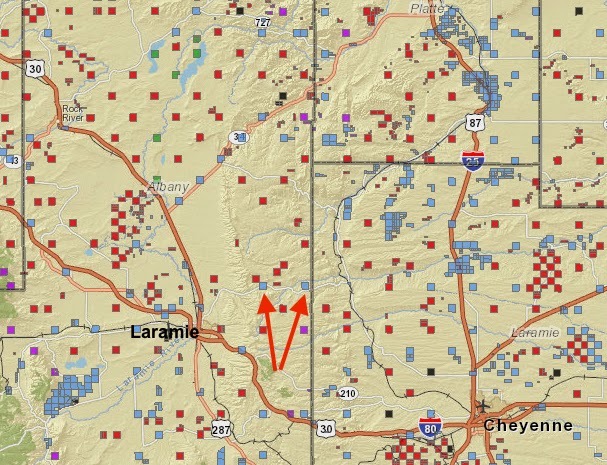 Several weeks ago I investigated two State parcels in the south-central Laramie Range, which is mostly privately-owned. 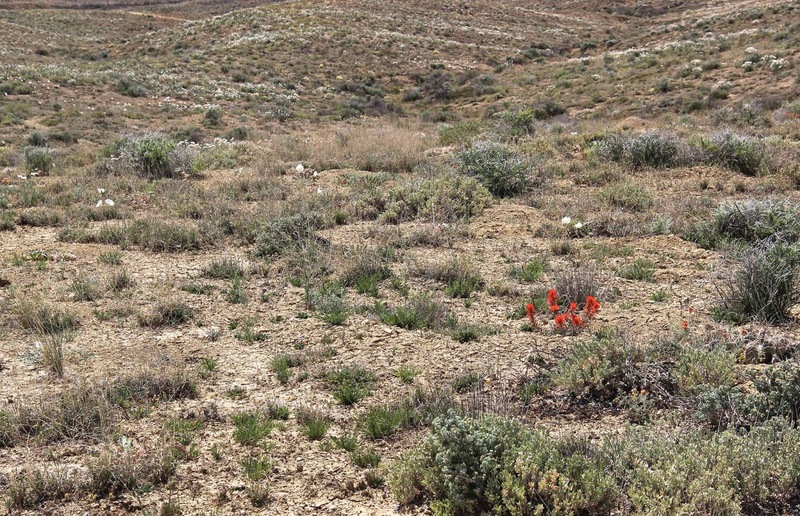 The vegetation is dominated by grass and sagebrush. 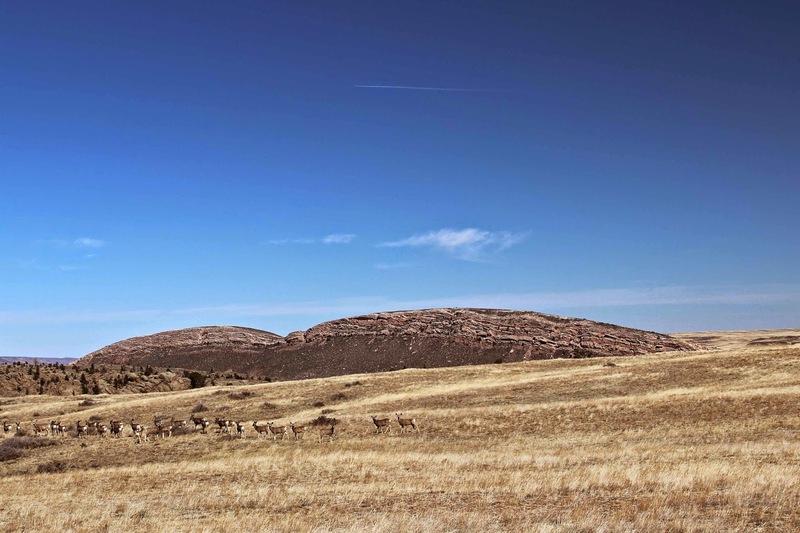 This may explain why ownership is private – early settlers homesteaded the grasslands to raise cattle and sheep. 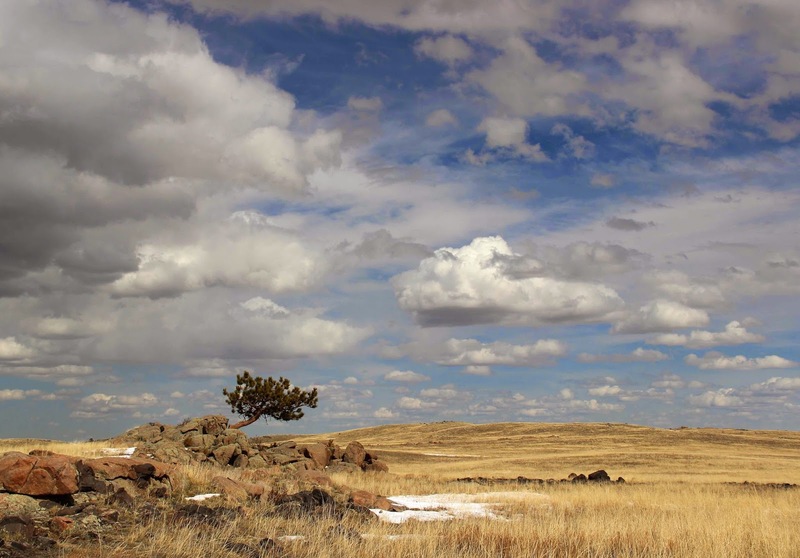 The south-central Laramie Range is largely treeless and mostly privately-owned. Arrows point to the two State parcels I visited (from the State Lands app). 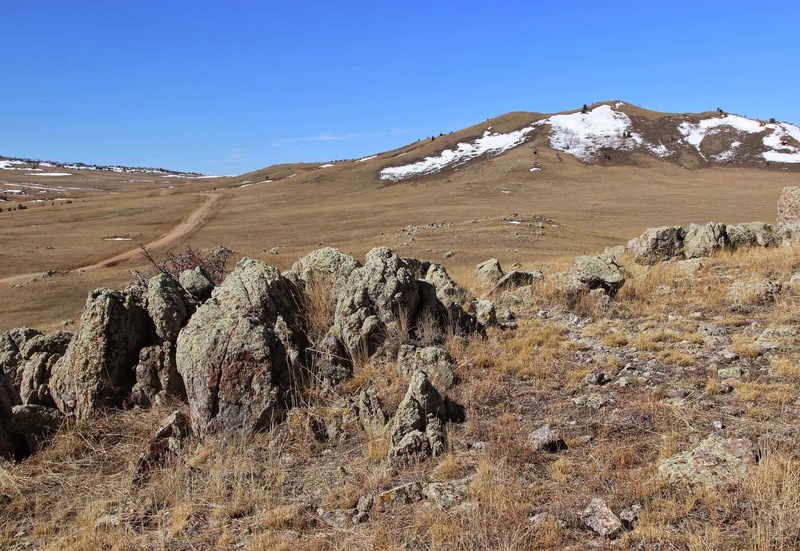 The two parcels are on the crest of the range along the gravel-and-dirt road from Laramie to Horse Creek. This a land of rock. 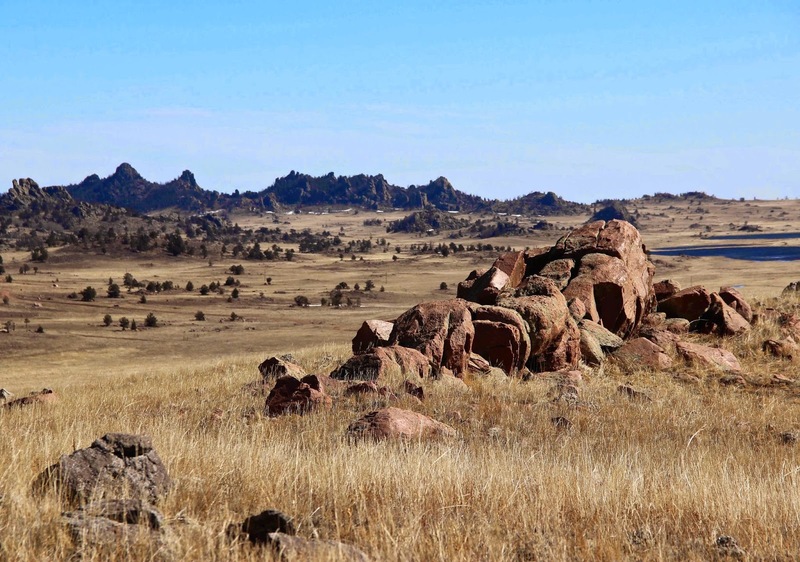 Outcrops of all sizes dominate the landscape. 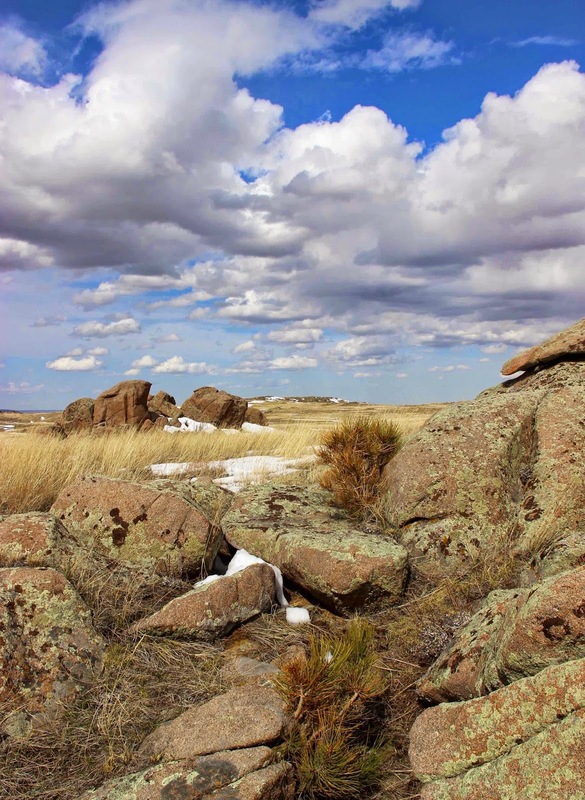 The area is underlain by a puzzling collection of intrusive igneous rocks called the Laramie Anorthosite Complex. 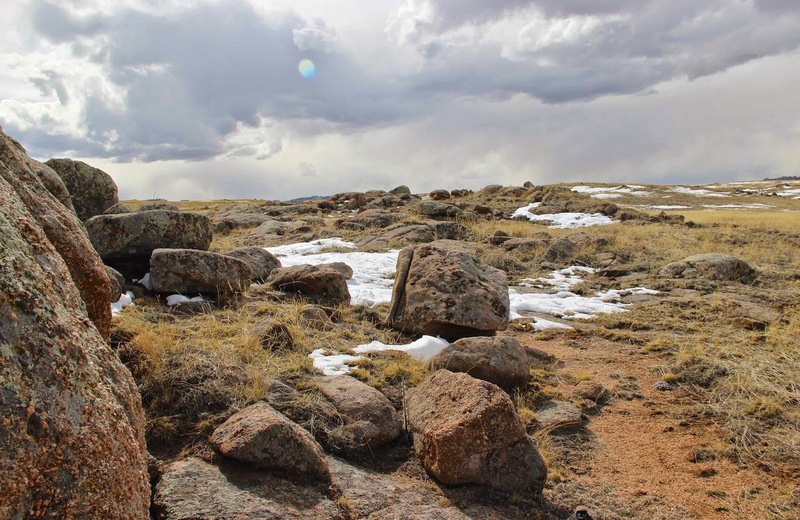 In fact, this part of the Laramie Range “is one of the best places in the world in which to study the origin and evolution of massif anorthosites” (source). But having an anorthosite complex nearby is a two-edged sword, even if it is one of the best. The LAC is fascinating but puzzling … fun to ponder but impossible to explain, beyond intelligent hypotheses. Whatever its geologic story, I like the LAC’s stark landscapes. I’m no petrologist, and I couldn’t be sure I was looking at anorthosite. But that’s what most of the outcrops are in the west parcel, according to the road guide. Intriguing ribs of reddish rock stretched across the ground in the west parcel (photo below). They might be monzonite as they matched the description in the road guide (fine-grained, dark reddish-brown) … or maybe monzosyenite. In any case, they were beautiful in form and texture. The reddish outcrop is a dike, possibly monzonite. In the east parcel I found outcrops of Sherman granite, which I know well from Forest Service land to the south. 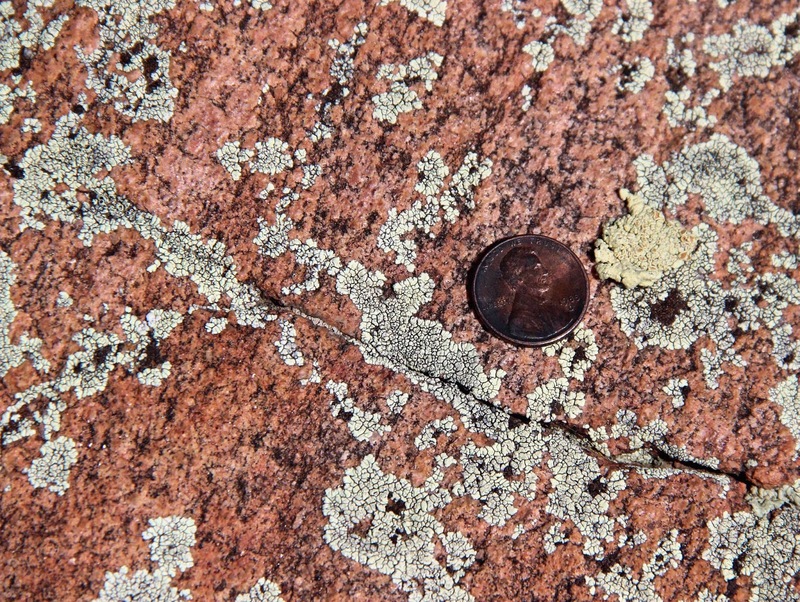 Sherman granite is one of the igneous intrusions of the LAC. 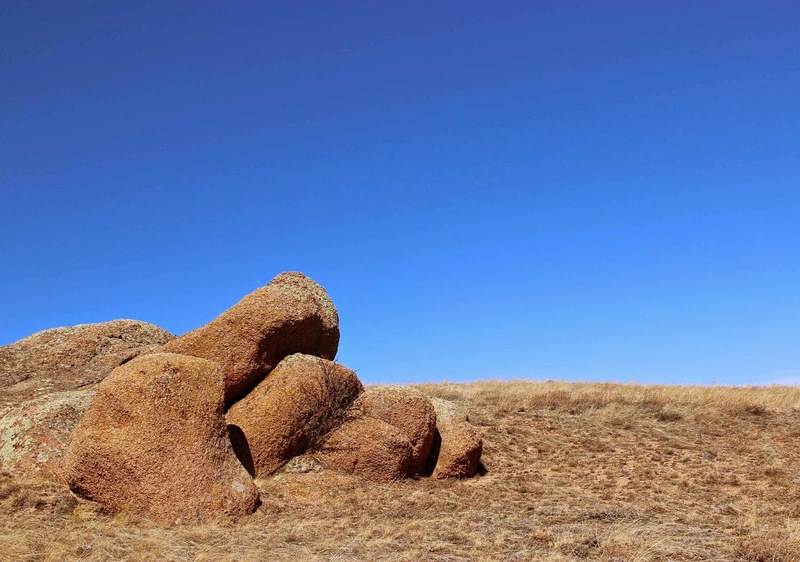 Same area … different granite? The view east from the east parcel was a geological treat. 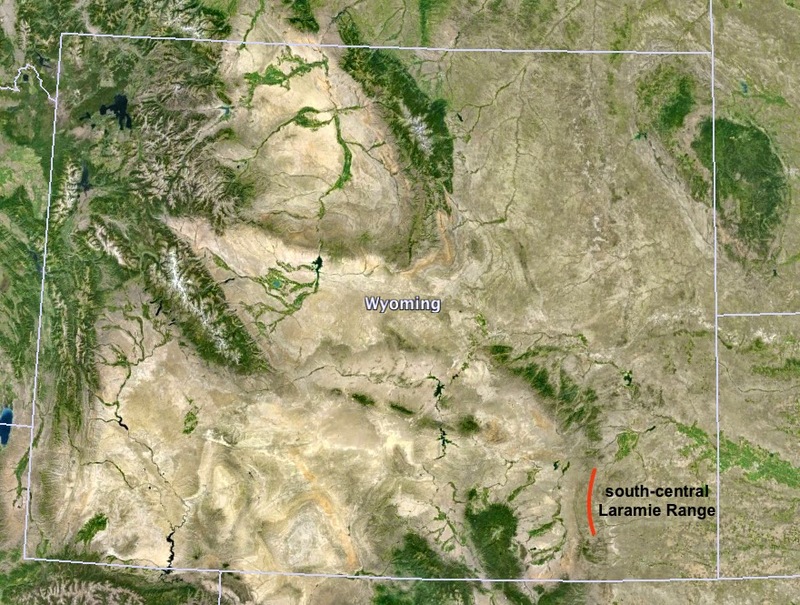 It includes the east flank of the Laramie Range and the Great Plains beyond. 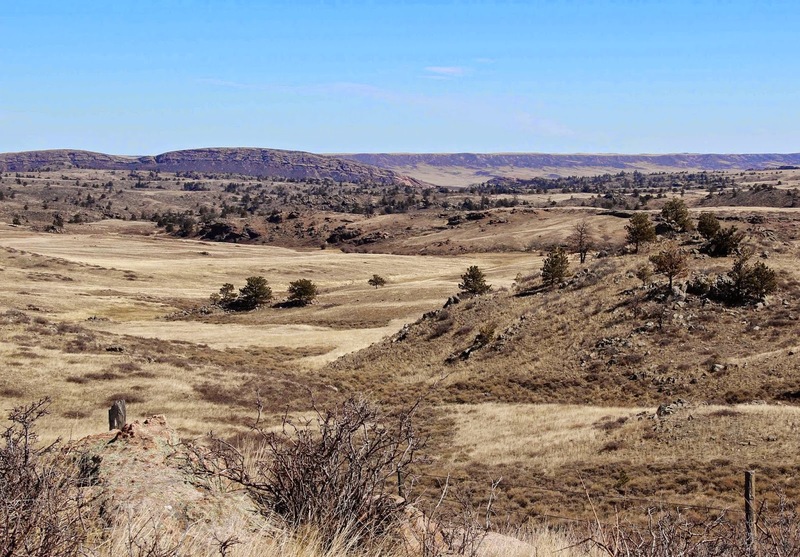 The landforms are familiar to students of Wyoming geomorphology: hogbacks of Paleozoic and Mesozoic sedimentary rocks steeply tilted during uplift, and in the distance a flat-topped ridge of Tertiary sediments deposited after uplift – debris eroded off the young mountains. Hogbacks on left skyline; relic Tertiary surface on right, in distance. I drove another mile or so east and stopped at a pull-out to look at the impressive hogbacks. A group of mule deer walking north stopped to look at me. Maybe they were going to visit the privately-owned hogbacks. Lucky deer … they have privileges I don’t. The plants were a lot easier to "understand" than the rocks. 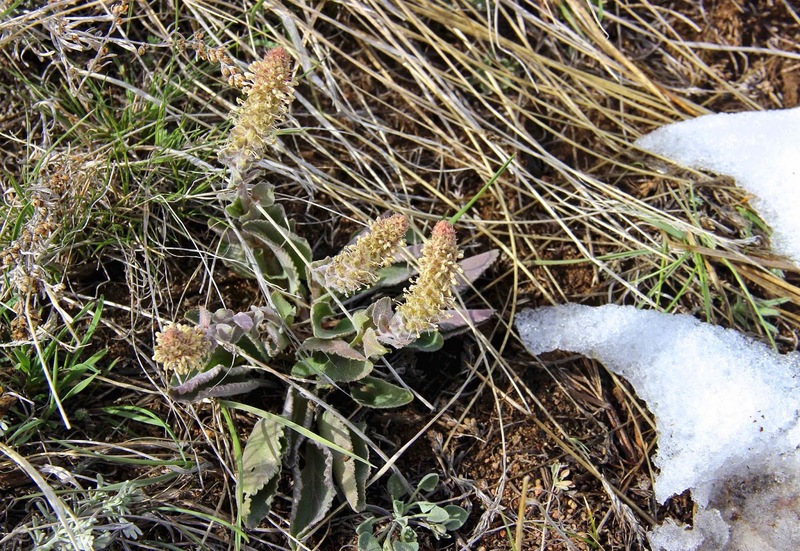 The growing season had barely started so I had to search carefully for wildflowers, but I found more than I expected. It was wonderful to see spring color! 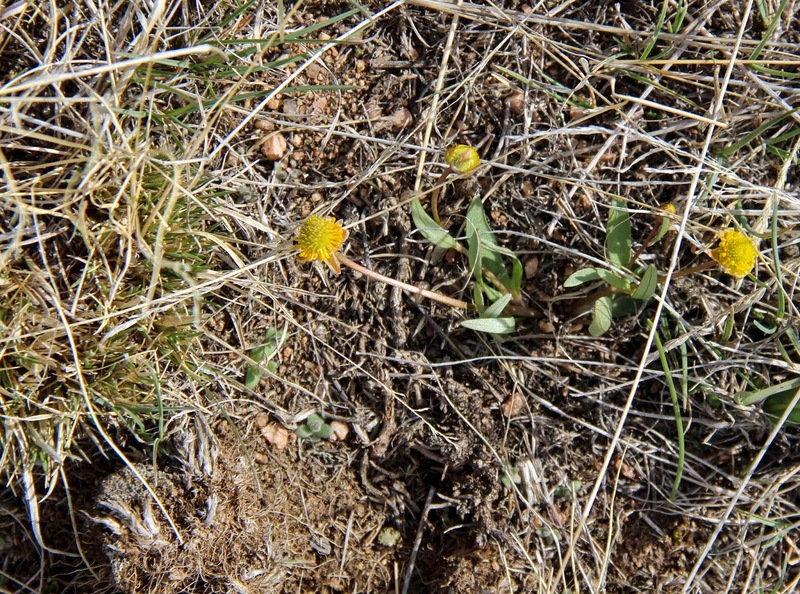 Sagebrush buttercup, Ranunculus glaberrimus, is one of the earliest wildflowers to bloom. Already the petals had fallen off and fruit were maturing. 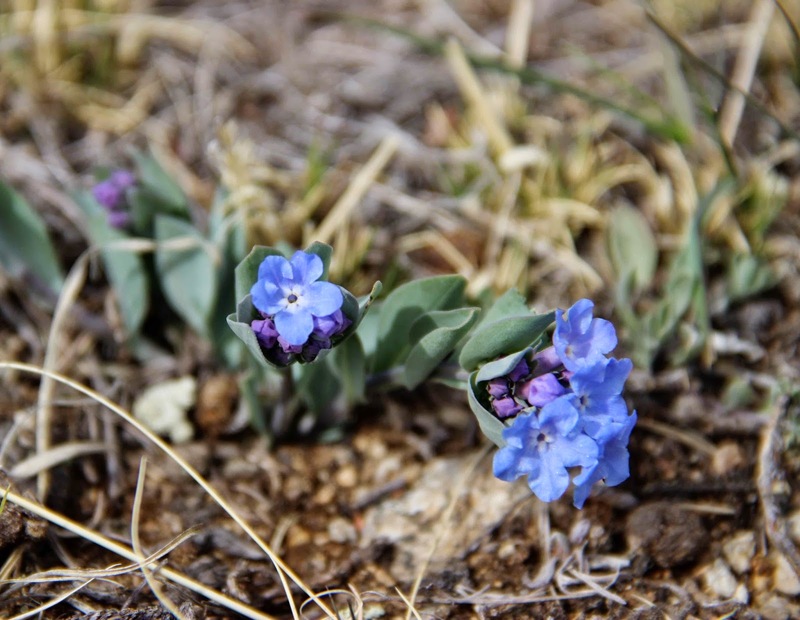 Rocky Mountain bluebells, Mertensia humilis. 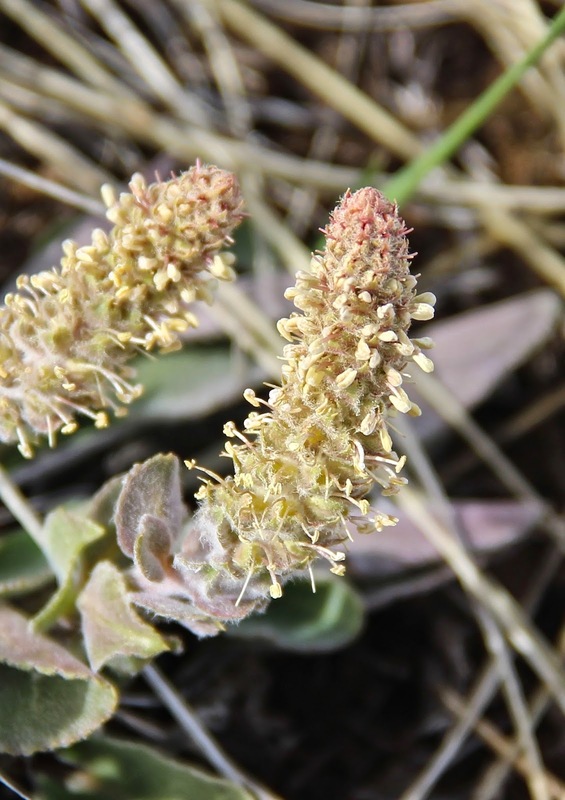 Wyoming kittentails, Synthyris (Besseya) wyomingensis. 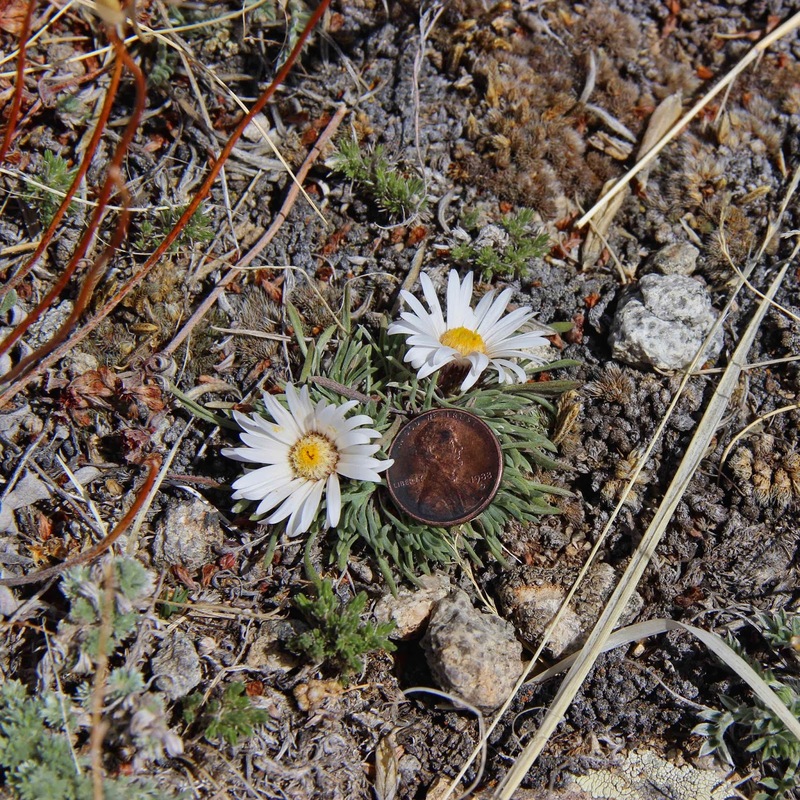 The Easter daisies were spectacular in the generally-drab setting. 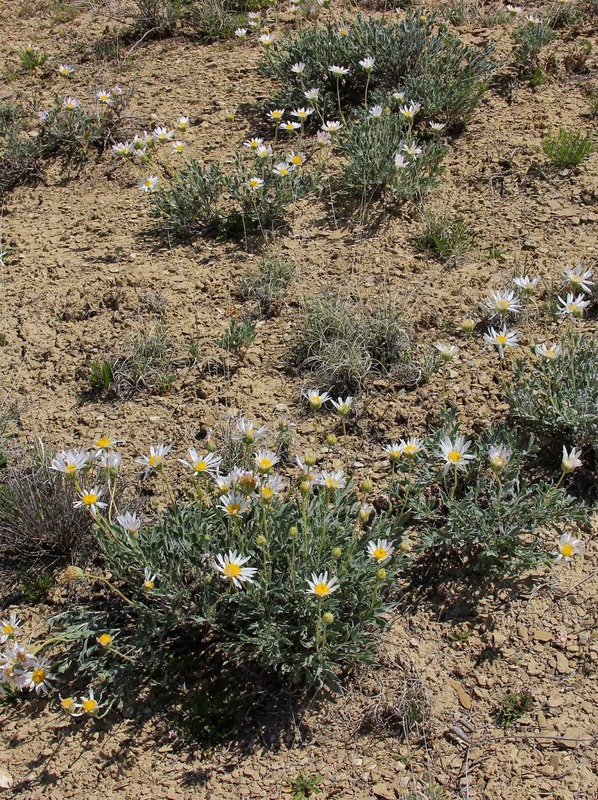 They’re low plants, but showy with their large daisies. 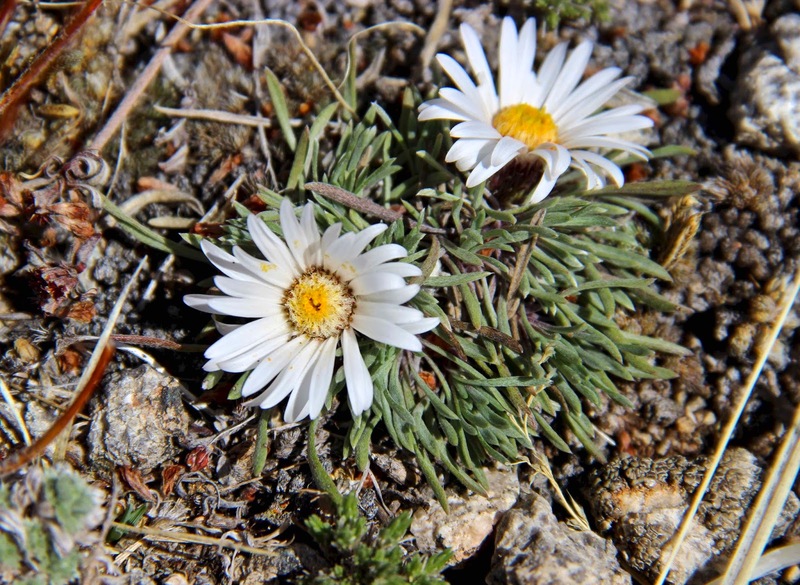 Easter or Townsend daisy, Townsendia sp. And who’s this … crouching low in the dead grass? It’s the rock-jasmine, a favorite. Its flowers are so tiny and elegant that they must belong to the Fairies' world. I wish I could find a way in! The next photo probably looks like an out-of-focus shot of small white flowers. But no … I was photographing spikemoss in the foreground. The angled structures are spore-bearing strobili. 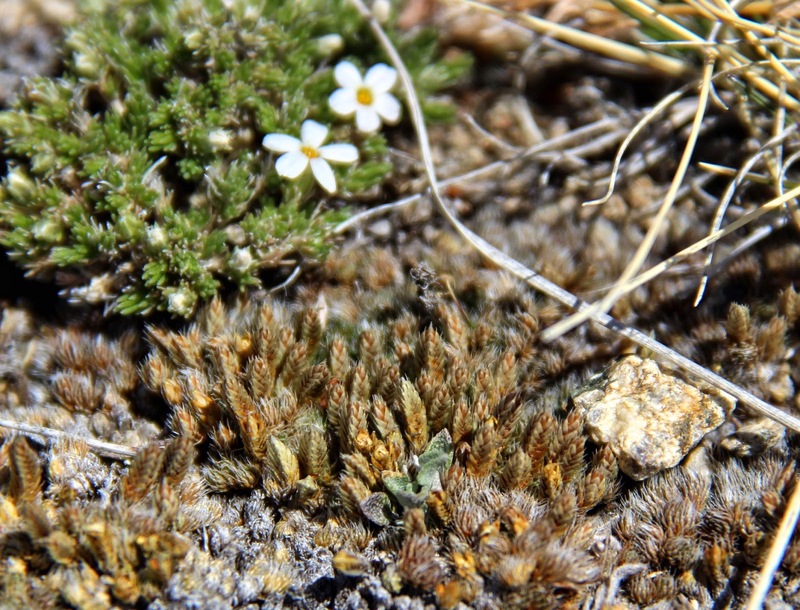 Rocky Mountain spikemoss, Selaginella densa. It’s a fern ally, part of a grab bag of not-closely-related, non-fern, spore-producing plants. 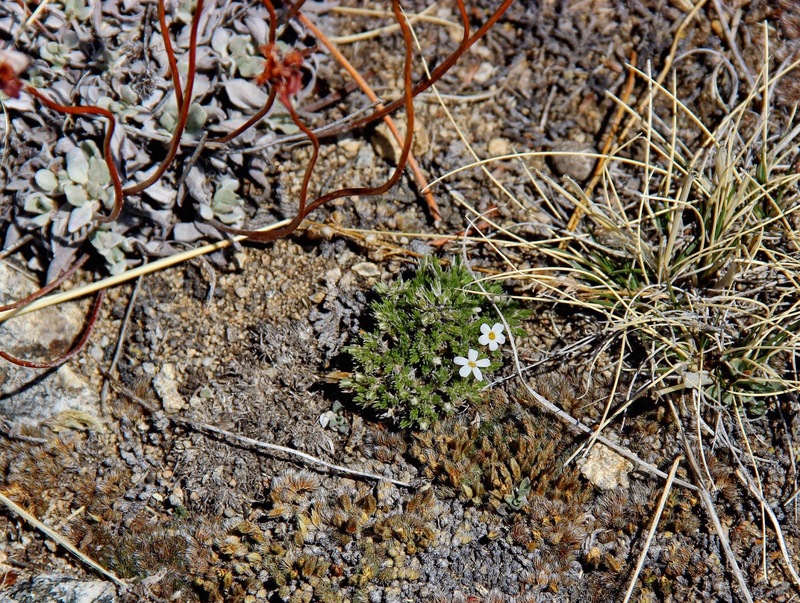 The small white flowers behind the spikemoss are Hood’s phlox. 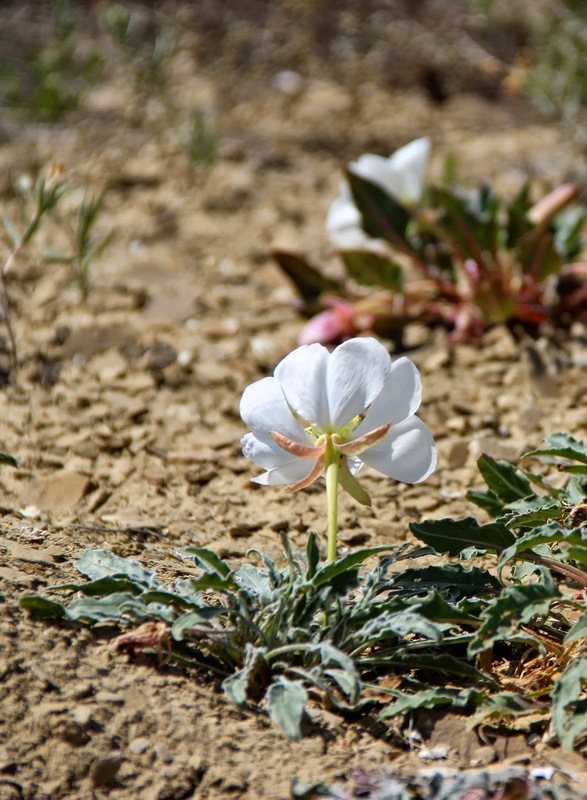 It's also called carpet phlox, and there was a time when Wyoming children called it “Mayflower” (source). Hood's phlox, Phlox hoodii. 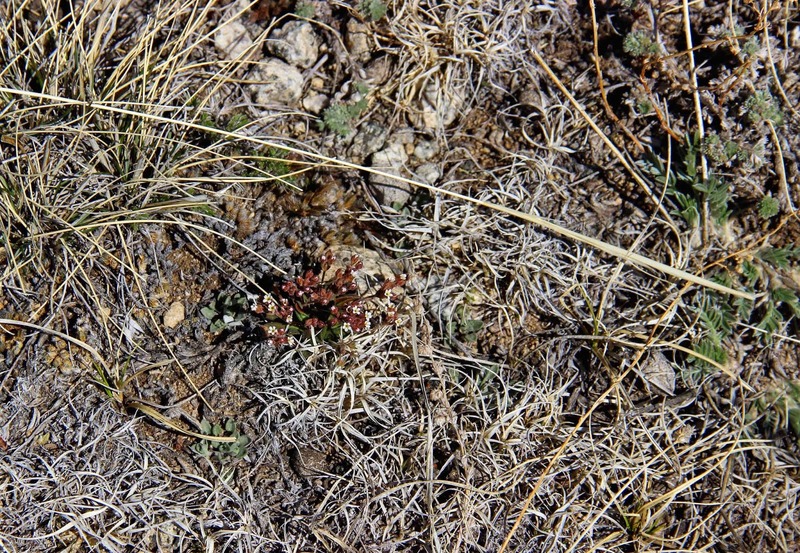 Gray leaves and dead red stems are a wild buckwheat (Eriogonum sp.). 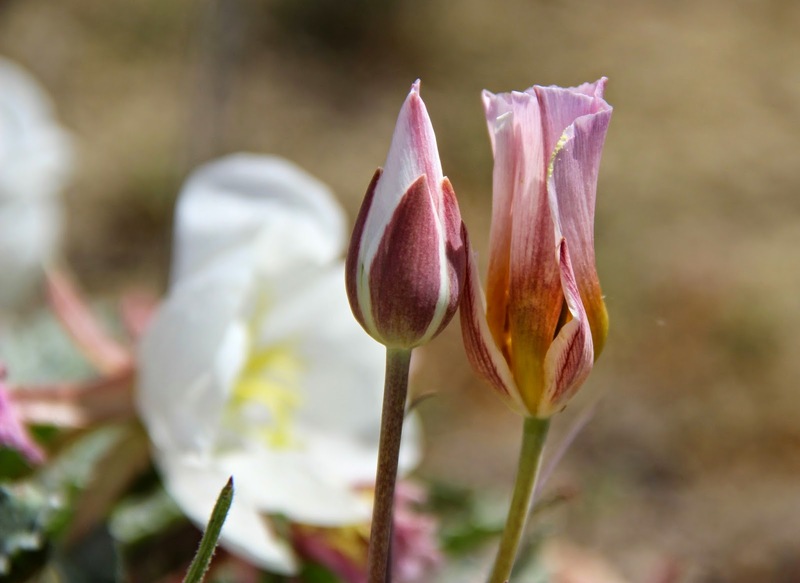 A few spring beauties were hiding in the grass in the shade of a single ponderosa pine. 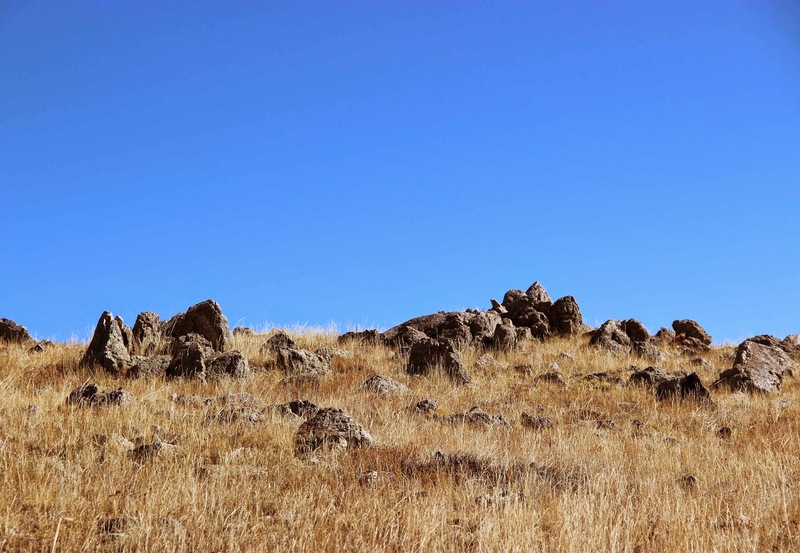 The tree grows on a granite outcrop surrounded by dry sagebrush grassland. It’s small so its shade is limited, but it’s enough to increase the local diversity a bit. 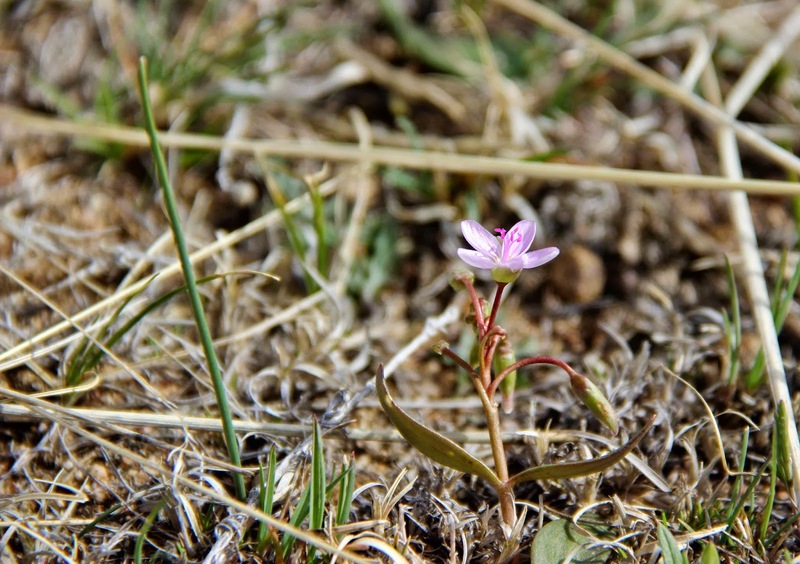 Spring beauty, Claytonia lanceolata, shows off its pink spring finery. I suspect this pine (Pinus ponderosa) survives on water that collects in deep rock crevices. Small saplings are trying to make a go of it too. Then I heard a meadowlark. He was taking advantage of extra elevation provided by rock and tree to broadcast his song. He moved to the top of the pine, and kept singing while keeping an eye on me and my field assistant. By late afternoon when I headed home, I had covered only a small portion of these parcels. But I found much of interest – both plants and rocks. And I now have two more natural areas to explore ... two more examples of the value of public lands. Ashwahl, LD. 2010. The temporality of anorthosites. Canadian Mineralogist 48:711-728. Frost, BR and colleagues. 1993. 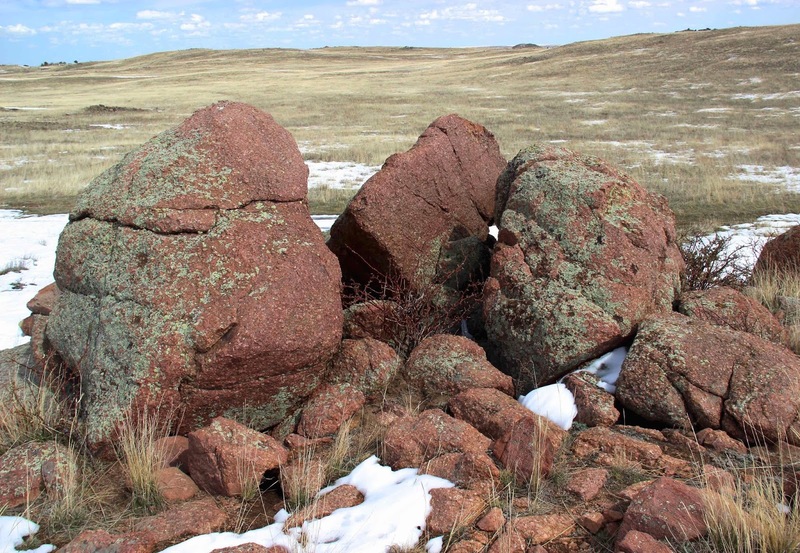 The Laramie anorthosite complex and Sherman batholith, in Snoke, AW, Steidtmann, JR, and Roberts, SM, eds. Geology of Wyoming. Wyoming State Geological Survey Memoir 5:118-161. Snoke, AW 1993. Geologic history of Wyoming within the tectonic framework of the North American Cordillera, in Snoke, AW, Steidtmann, JR, and Roberts, SM, eds. Geology of Wyoming. Wyoming State Geological Survey Memoir 5:2-56.